One of our latest and greatest camera additions is our overhead camera used for live demonstrations. With this camera angle you can drive your audience’s attention to an overhead shot of your products, taking them directly into the action! Enhance your production and elevate your show to the next level. In this episode we review various types of ceiling mounted cameras include flush and pole mounted options. In our studio we use a flush mounted ceiling camera and in various pictures shown from our customers we demonstrate the pole mounted options as well. Pole mounting a PTZ camera is ideal for spaces with high ceilings. A pole mount allows installation crews to install cameras at the perfect location. When you are mounting a PTZ camera many times you want an angle that will allow your talent to have a eye level view. With ceiling mounted cameras you may want to have an overhead view for annotation over documents and other types of media. Yes, it was quite fun during our live broadcast to start using the NDI Telestrator. This application runs on a Windows based tablet and allows us to annotate on any NDI source on our network. In order to make it easy for us we are using the vMix output to annotate on. This way our video producer just using the NDI input as an overlay providing the telestration layer. Annotation on documents allows presenters to draw audiences attention to details inside their presentation. Using the NDI Telestrator on a live video feed is often used in video production during professional sports. 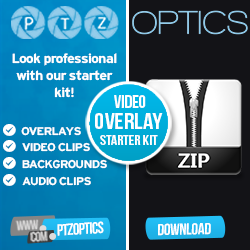 It’s so awesome to see this technology available to the common video producer!